My inspiration was this "pintuck pillow" at the Long Thread. I hesitate to call mine pintucks because they are quite wide really. Hooray for maths, which helps you to make the cushion right first time, in any size! Tucks are 1/4" and spaced by G as shown. First, choose your finished cushion size, X. Mine was 20.5" each side. Then choose how many 1/4" tucks you want, Y. I went for 16 tucks on my cushion. For Y tucks, you'll have Y gaps between rows of stitching, and we want to work out how big these gaps will be by calculating G = X/Y. For me, G = 20.5"/16 = 1 9/32", or 1 1/4", close enough. When we make the tucks, we'll centre them on the cushion, so that there's a gap of G/2 at each side of the cushion before the tucks start. How big should the fabric be? 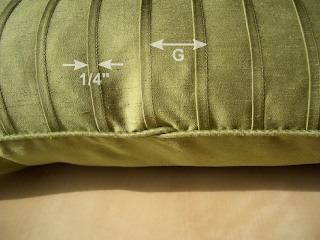 Each 1/4" tuck uses 1/2" of fabric, and we also need to add 1/2" all round for the seam allowance when we cut the cushion back. So approximately I'll need a piece X + Y*1/2" + 1" wide by X + 1" high. For me this is 20.5" + 16*1/2" + 1" = 29.5" wide, by 20.5" + 1" = 21.5" high. If you can, it's better to cut out a piece a few inches larger than this all round. This is because it's easy for your tucks to pull light fabric off-square or for the piece to end smaller than you intended. Just a 1mm error on each seam makes over 1/2" error by the time you have tucked the whole 16! So do all the tucks in a bigger piece and cut it back to size at the end. 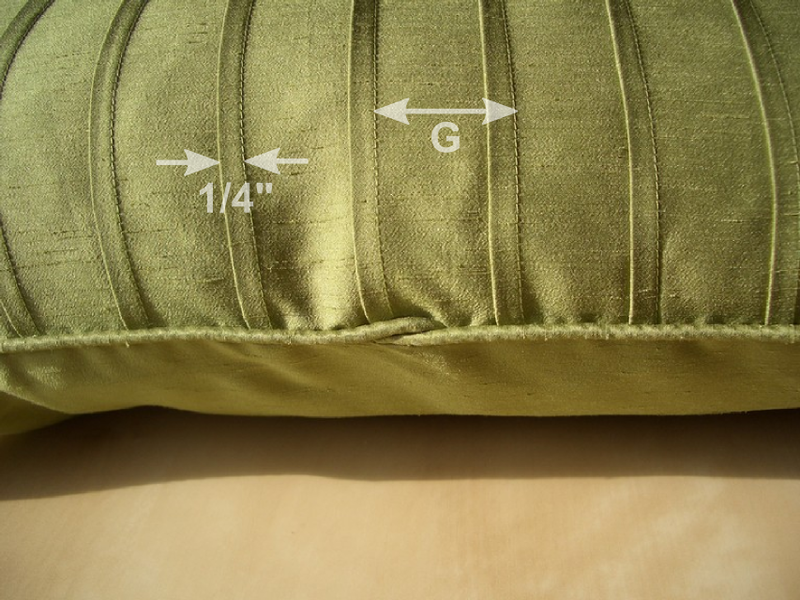 The first crease should be at least 1/2" + G/2 + 1/4" from one end. This is the seam allowance, plus half-a-gap, plus the 1/4" tuck size. I ironed my first crease more than 1/2" + (1.25"/2) + 1/4" = 1 3/8" from one end. Actually, I probably did it 2" from the end because I'd given myself the wiggle-room discussed above. Then, with the piece still folded wrong-sides together, I stitched the 1/4" seam as discussed. It's then just a matter of pressing and stitching and pressing again for each tuck. The next tuck should be made by pressing the fold in at a distance of G + 1/4" from the last stitching line, which for me was 1.5". Then once you've stitched and pressed you'll find the stitching lines are separated by G.
A word on picking threads, as the stitch line is visible in this project. Always take your fabric with you and look at a length of the thread unwound from the spool and lying over the fabric. You're unlikely to get a good match without doing this, as the thread can look very different on the spool! If in doubt, go a shade darker than the fabric, not lighter, as this will blend better. Cut your front back to the intended size, for me this was 21.5" square (for a 20.5" cushion with 1/2" seam allowance all round). I find a quilters' square, self-healing mat and rotary cutter are good for this job. Make sure your tucks are central on the cushion front as you do this! I added a button back to my cushion. Details on how to do this (and fabric amounts) are here. You can just stitch the front directly to the back, but I prefer the look of piping. I made my own covered piping using strips of fabric and piping cord. One is supposed to cut bias-strips at 45 degrees to the grain, as the fabric flexes and bends better, and I'd imagine wears better too. However, I am cheap and ignored this as it leaves you with either (a) two very large annoying triangles of fabric left and an empty wallet, or (b) nearly used-up fabric, but piping with many seams in it, or else yards and yards of piping. Anyway, more on piping in the aforementioned post on button backs.